Post subject: What's this mobo header for? To those that have cracked the case to replace the memory or processor, or just because, did you notice the header next to what I think is the Northbridge heatsink? Any clue as to what this is for? Secret HP header to connect KVM? Also, I think I saw some pins near the rear of the mobo (just visible about the heatsink) that look like more USB connections. Last edited by haleme on Tue Jul 27, 2010 8:34 pm, edited 1 time in total. I believe that is just one of 5 unused jacks locations. There is a three pin jack in front of the CPU, and two four pin jacks between the memory and the CPU, hidden and somewhat blocked by the heat sink, as well as the jack to the left rear. The plan however is to compare these results with what DVI/VGA & PS2 voltages should be. (The SIS 761GX Northbridge has integrated video, and the SIS 966 Southbridge has keyboard & mouse). Anyway the results... maybe someone can help make sense of it all. Edit: Updated with info provided by JRock NB: VGA pins 11 & 4 are by definition unconnected but I connected them to a ground (CN2 Pins 3 & 4) without issue. Last edited by ymboc on Sat Jun 07, 2008 8:34 am, edited 18 times in total. It seems to me that it might help to measure some of the connectors that we know. Such as the ones to the fans, and the one to the USB port in the front. There are several connectors around the CPU that **might** be fans or USB ports. Just a thought. I think the fan header by the PS Cable / CPU is already identified on the silkscreen. I can confirm as I had a small CPU fan connected to it while I was testing the voltages (the Northbridge got pretty hot during testing). The other smaller connectors between the CPU & Memory I'm not too interested in because I can't imagine what I'd plug into those anyway. Specifically I want to find a way to display video, and a way to get keyboard input (PS2 if possible but I'm sure (the easily avaialble) USB ports would do. Really what I need to find is what the signaling voltages are for each pin of DVI/VGA & PS2 are (since that is what my wishful thinking wants to find most). Have you tried USB monitors ? that way you can connect a monitor to the server as well as usb keyboard and mouse ? I'm curious when you did your testing did you have an OS loaded on your EX47x or did you simply have it on with no OS loaded? Did you install the backplate and the at least one disk drive? Would the values be meaningful if there was no driver loaded or would they simply be noise? We know that the bottom rear USB port will accept a USB keyboard and that the keyboard can interact with the BIOS, my guess is there maybe only one keyboard driver loaded at boot time. Just a thought. So you actually plugged a fan into the front (between the CPU and the front cover) three pin port by the CPU and it worked? Did this fan appear to be controlled speed wise by the BIOS? So this was with the PowerSupply & Board completely pulled & backplane not connected. Voltage Readings were with the power connected and system turned on. Ground Continuity test was with the power disconnected. The values would be meaningful because a video signal would be outputted even if not in the OS (if that is infact what the connector is for). 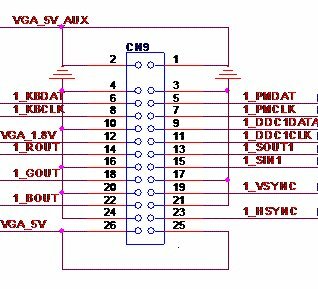 Same goes for the other header (if infact it is for PS2) because voltage needs to be supplied for the keyboard/mouse to work. The state of the hardware does not really change very much when the OS is loaded vs just beyond the post screen complaining that there's no hard drive to boot off of. Really, the bigger concern for me is if let's say that 26 pin connector is a DVI connection... I'm not sure but I think DVI ports may not output a signal until they think a monitor is actually attached. This is at least what my HDMI DVD players do. If this is the case, it throws another wrench in trying to figure out what all these connectors do (and how to exploit them). RE: USB Monitors... Didn't know they existed until just now... I can't imagine that there are many bios' out there right now that support it. get an adapter....this company has invented where you can attach a vga monitor to the adapter which will be able to plug into your usb port. Having read the product info it seems these USB video adapters it seems they are only able to provide an additional video output... and that probably only from within windows. Interesting but unfortunately not very useful for what I'd like to do with the hardware. CN11 and CN12 are JTAG headers for board production tests. USB video won't work without BIOS support, I don't believe. Me I'd be looking for a serial output somewhere, or for a USB serial adapter that is recognized. IMHO drivers for a USB Video adapter are unlikely to be included in the BIOS and you will need drivers in the BIOS. If we can find a datasheet for the 761gx and 966 like what's available for the IT8705 then we're cooking as we'll be able to map it out from there. That said, it'll be a little easier said than done if both the NB & the SB are BGA's. (I'll have to compare against photos I took because my unit's back together). There's serial ports on the IT8705 but aside from a RF remote receiver or legacy UPS support I don't know what I'd do with a serial port -- certainly nothing I can't do with a USB<>serial adapter. I'm hoping to find video & keyboard/mouse input... and maybe the PC buzzer/beep. Everything else I need I think is already provided. I wonder who's gonna be the first to short out their m/b ? ?